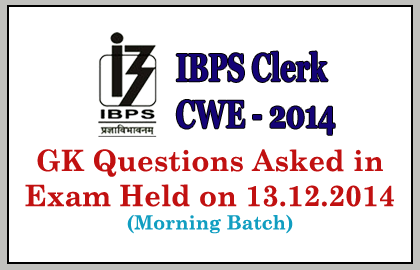 List of GK Questions Asked in IBPS Clerk IV Exam held on 13th December 2014 (Morning Batch). Candidates whose who are preparing for IBPS Clerk, SBI and other competitive exams can use it. Which sport does the Seema Punia belong to? What is the PPF maximum amount limit? Where does the Headquarter of United Noations Development Programme (UNDP)? Which country is in first position in Asian Games? Who won The Noble Prize for Literature 2014? Air Force Day was observed on? Which company has launched new Email service called Verse? Richard Miller Flanagan who won the Man Booker Prize 2014 was belongs to which country? Who is the Earth Science Cabinet Minister? CASA is what type of deposits? What is the constituency of Nitin Gadkari’s? ING Vysya Bank was going to merge with which Bank? Which Medal does the Women Kabaddi Team has won in Asian Games? Interest for Savings Account was given by? Tintu Luka was related to which sports? What is the theme of SAARC summit 2014?